Wood Group Pratt & Whitney's extensive network of field service staff and access to Pratt & Whitney records makes Wood Group Pratt & Whitney the ideal partner to work with in repositioning your FT4 equipment. Please call us if you are looking to buy or sell excess equipment. With the largest inventory of GG4 and FT4 assets, we can respond quickly and competitively to almost any request. Wood Group Pratt & Whitney maintains an extensive inventory of parts, components, and assemblies to support the service and repair of GG3, GG4, and FT units. 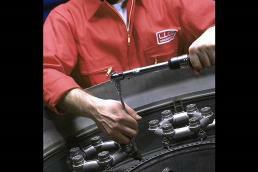 We offer serviceable, overhauled, or new parts and components to best meet your specific needs or requirements. Wood Group Pratt & Whitney, in partnership with the OEM and OEM approved vendors, supports ancillary base plate equipment such as base plate switches, radiators, cooling fan motors, linear directional valves, water injection skids, and inlet fogging systems. WGPW is pleased to offer GG4 Users the latest in industrial grade replacement air and/or gas starters. WGPW is a supplier of the TDI turbine starter.